With the new season of brinjals ripening in the vegetable garden, it is time to include brinjals in our meals, from roasting to dips. 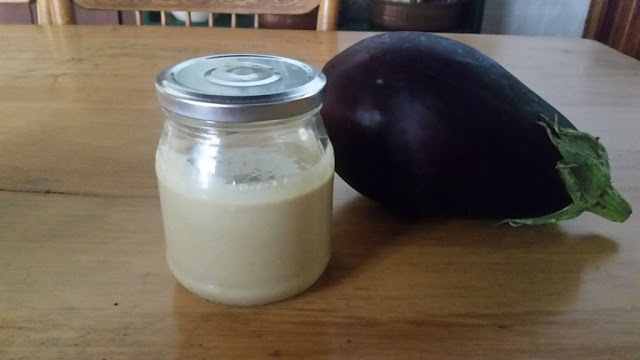 Deciding to make baba ganoush, meant that I had to make tahini. This ingredient is not easily found in Bonnievale. So I started my baba ganoush by roasting 250g of sesame seeds in a black iron pot over low heat for about 5 minutes, while stirring the seeds continuously. The roasting sesame seeds exude the most amazing aroma. After roasting, I let them cool down in a ceramic bowl. After they cooled down I used a stick blender to blend the seeds together with ¼ cup of mild olive oil. 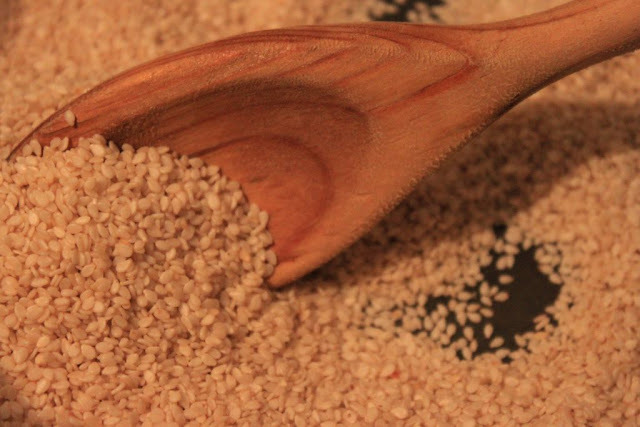 One can use less olive oil if you would prefer coarser sesame butter. I prefer a smoother butter and that is why I used more olive oil. With the tahini ready, I focused on preparing the other ingredients for the baba ganoush. I had to grind ½ a teaspoon of cumin seeds. 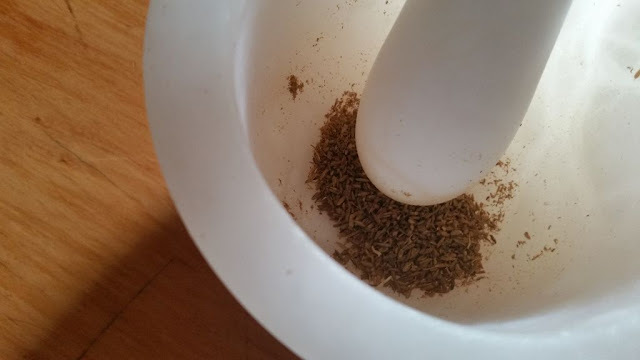 I love the smell and taste of cumin seeds and enjoyed grinding the fragrant seeds in a pestle and mortar. The garden supplied the garlic, lemon and parsley. Choosing the two large brinjals that the recipe called for was easy. There are rows of the fresh purple fruit in the brinjal bed in the vegetable garden to choose from. An evening braai (BBQ) presented the perfect opportunity to grill the brinjals over the open fire. I prefer to grill the brinjals on a wood fire. The wood from the old apricot trees, made the perfect fire to char the outer skin of the brinjals. 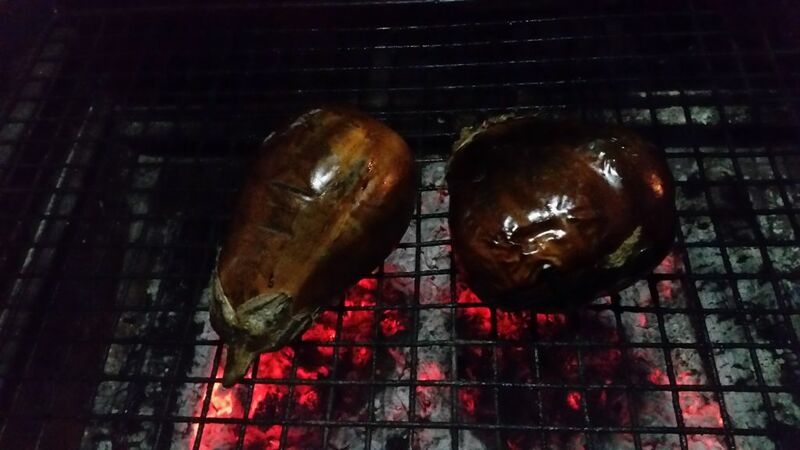 Charring the brinjals on an open fire, gives them a delicious smokiness that is called for in proper baba ganoush. The charred skins of the cooled brinjals removed like a dream. In no time, I was able to prepare the baba ganoush with home-grown and homemade ingredients. 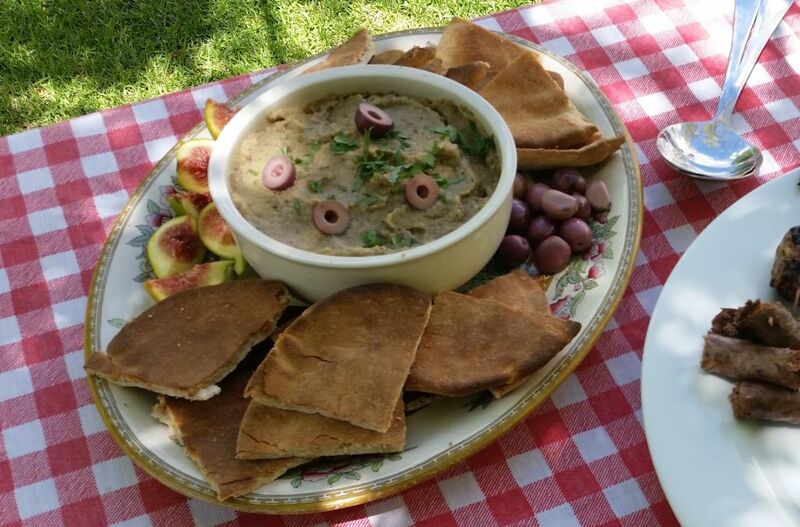 We enjoyed the baba ganoush with roasted pita bread, fresh ripe figs and homemade olives. I agree that making the ingredients for baba ganoush from scratch is not advised if you want a quick lunch. But I indulge it to savour the fragrance of the journey of making this middle-eastern dish. It gives me a sense of pure enjoyment. Knowing the journey of each ingredient as it becomes a dish that can be enjoyed with friends on a hot summer’s day under the oak tree. 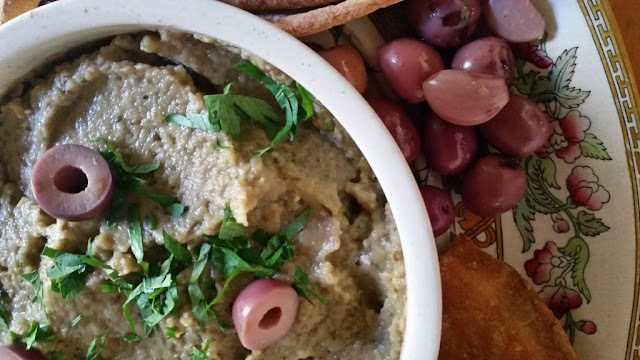 The flavours of the figs and olives also work so well together with the Baba Ganoush. Thanks for this post, lovely images.